On average, employees spend two-thirds of their day at work. Being in the office, among their colleagues and managers, is a major part of their life at large. How happy they feel at work is, therefore, significant at the personal and professional scale. The concept of “employee happiness” is one of true value to the corporate world. Not only are well-established businesses progressing to maximize their employees’ satisfaction, startups and entrepreneurs are also beginning to view “happiness” as a talent sourcing and retention trick. And whether they use flexible hours, topnotch technology, in-office game rooms, or infinite snack supplies, the options to pull in the crème de la crème of job candidates and make sure they are kept happy and productive are now more diverse than ever. The reality is: there is an increasingly heavy demand on the employer’s end to cater to employees’ well-being, health, and contentment at work. And while many forward-thinking startups would jump at the next opportunity with their teeth, to make sure their workplace is as happy as it could get, it is a good idea to step back: see what truly makes a difference for the employee and what is practically within the control of the company. As much as we hate to admit that personal matters are completely sealed away while at work (and vice versa), the reality suggests otherwise. This is the first myth to recognize regarding employee happiness. The line between personal and professional happiness is actually blurry. Bayt.com, the leading job site in the Middle East, surveyed professionals from various industries, career levels, and locations to understand their views on happiness and what influences it. As predicted, there are many factors that impact employee happiness that overarch personal, geographical, socio-cultural, and professional dimensions. The Bayt.com Happiness in the Middle East Survey, January 2017, revealed that more than half (56%) of respondents are happy with their lives, at least to some extent. The survey findings are very positive in certain elements, such as the 83% satisfaction rate with family relationships. But there are also a few concerning areas. So, this is the time to debunk some of the myths surrounding employee happiness and hone in on the factors that truly make a difference. Although health is a topic that would normally fall under the “personal life” category, it is unwise for businesses and organizations to completely ignore it. Take, for example, physical health and fitness. Research, such as the Bayt.com Happiness in the Middle East Survey, have repeatedly shown the correlation between healthiness and happiness. But even in terms of performance and productivity, employees who are physically healthy are less likely to demonstrate inconsistent performance or have health-related productivity issues. Mental health too can be of significant impact on employee productivity, satisfaction, and overall happiness at the workplace. As an employer, you might still be wondering what your role is in this matter. According to the Bayt.com Health and Lifestyle in the Middle East poll, March 2016, 96% of polled respondents believe it is the employer’s responsibility to promote employees’ health and wellness. This can go beyond the basic health insurance. Many companies are beginning to offer gym subscriptions or discounts, nutrition counseling, healthy office meals, and generally more attention and care towards the physical and mental health of their talent. Indeed, professionals across the Middle East and North Africa (MENA) can experience stress to varying degrees, and due to numerous causes. For instance, 70% of respondents to the Bayt.com Happiness in the Middle East Survey cited the “increasing cost of living” as the main stress contributor. This particular factor may be beyond the direct influence of employers (although salaries come into play as discussed in the next point). 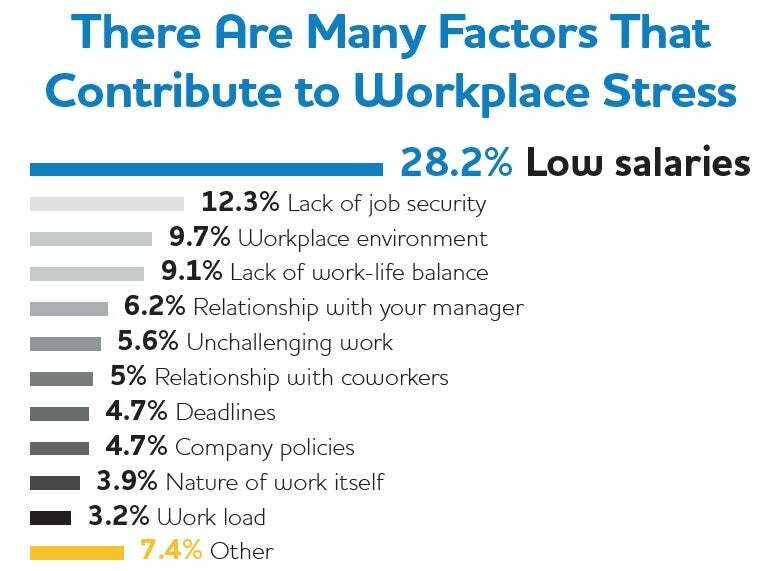 That being said, nearly half of surveyed employees referred to “work related issues” as the main stress contributor in their lives. These “issues,” which include work-life balance, job security, deadlines, and workload, are all within the reach and control of companies. Stress is an issue that businesses, especially those who are in the startup phase, must be aware of and competent to handle. Employers are encouraged to engage in candid and frequent conversations with their employees. Whether through surveys, meetings, or casual chats, the goal is to gauge the employees’ stress level and guide them towards a happier and more balanced state. Money cannot buy happiness but money is, without doubt, a powerful tool. Not only is it needed for sustenance and physical well-being, but it is also frequently a requirement for quality education, healthcare, investments, entertainment, and many other essential life aspects. So, we can say that happiness is not the immediate outcome of money, but it is realistically so in the long-term. Although millennials, who will soon make up the majority of the workforce, are now giving high value to non-monetary job attributes, such as opportunities for career growth and learning on-the-job, the Bayt.com Millennials in the Middle East and North Africa Survey, February 2014, showed that seeking a higher salary is still a significant incentive to join a specific company or field of work. What employees often struggle with in our region is the mismatch between salaries and cost-of-living. Companies who are invested in their employees’ happiness should truly assess their salary levels and pay structures against the region’s cost of living. There are highly effective tools to do that, such as the Bayt.com Salary Search. Using this, employers can ensure that they are not undercompensating or overcompensating their employees at all times. 38% of those surveyed in the Bayt.com Middle East and North Africa Salary Survey, May 2016, claimed they had never received a salary adjustment, despite the ever-increasing costs of living. It is not surprising, therefore, that salaries can easily become a major source of unhappiness at work. Out of all professional life elements that impact happiness, the “availability of career advancement opportunities” seemed to be the most neglected item. 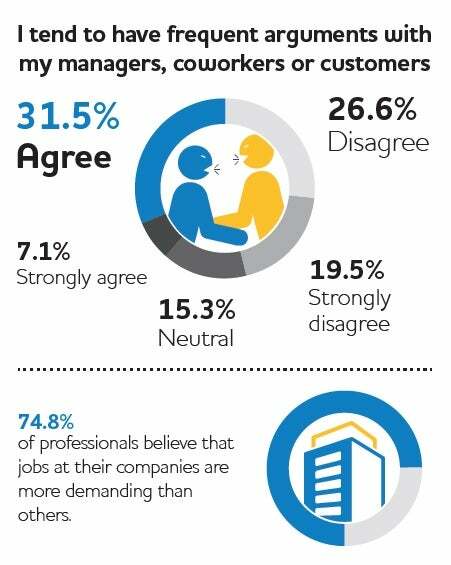 The Bayt.com Happiness in the Middle East Survey reported that only three in 10 surveyed employees are satisfied with the career advancement opportunities at their current jobs. If employees feel stuck in their current position and that there is no room for them to grow or advance in their professions, it is very unlikely that they will be happy at work. Talented employees in most cases have a clear career map, with milestones to tick off, and end-goals to pursue. They want to have an employer who listens, supports, and empowers. They want to feel secure about their career future and equipped with all the training and development resources. A main takeaway here is: providing opportunities of career advancement might be of higher value to certain employees. Some may be happier with a new position, a promotion, or even a training opportunity, over a lavish private office for example. Companies simply need to listen. Employee happiness is a very important topic. There are numerous factors that could influence it and, in return, it can have a significant impact on productivity and performance. Companies are right to adopt progressive policies and invest in their employee’s satisfaction. But to successfully achieve employee happiness, employers need to define their corporate culture, assess their employees’ needs and goals, and begin implementing their strategies accordingly.